Blast from the past: originally published June 25th 2005. Tape libraries are not new to the industry, but entry-level rackmount units can fit the small to medium enterprise bill. I recently had the opportunity to install and experience an adic FastStor 2 LTO eight slot 2U rackmount tape library. We had been using a single tape drive that required swapping tapes daily. This was sometimes hard to remember but guaranteed a backup of critical files that were frequently accessed. As we added more storage it sometimes required swapping the tape out for daily backups, which is just plain ugly. Since we needed a new tape drive to fit the additional storage, why not get a tape library and have it handle tapes for a week at a time. 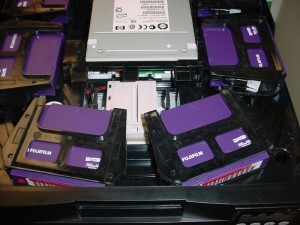 ADIC ( they mix capitals and all lower case on the website and on equipment ) makes a wide range of tape and backup hardware, but the FastStor 2 is the introductory tape library. It’s available with a LTO-1, LTO-2 or SDLT320 tape drive; everything else remains the same. We went with the LTO-2 for a maximum storage capacity of 3.2 TB; an HP drive was installed ( see photos ). Unpacking and installing allowed me to examine the library. Very simple design: tape door and four button LCD panel on the front, two 68 pin high density SCSI connectors and a power switch on the rear. It required active termination so I hooked it up and powered the unit on. I went through the simple and effective menu to load tapes; at that point the door slides open and you insert the tape. Otherwise the door stays closed, everything safe and sound within. Unfortunately there was some grinding as I loaded the tape in, and everything stopped working. A quick call revealed something must be off track, so I had the opportunity to crack the case and look inside. A few screws later the top was off and I was able to see how it worked and grab the photos above. 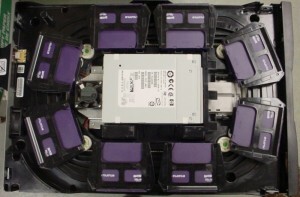 The drive sits in the center and the eight tapes are held in hard plastic braces that move around on a rubber belt. When it reaches the desired tape a small arm brings it out of the brace and into the tape drive. Ejection is handled in reverse; all in all a simple solution. Cooling for the drive is provided by two fans: one behind the drive pushing out the bottom and one at the rear. It appeared that one of the tape braces had come off the track in shipping, so I put it back on and we were back in business. 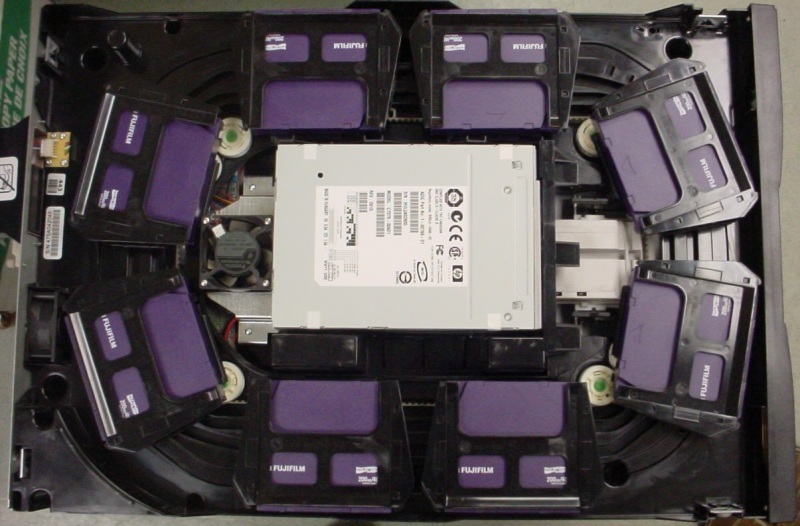 Performance was within expected parameters for a LTO-2 drive; as this library can accommodate three different drives the mechanics stay the same. We use Veritas Backup Exec which has additional functionality for libraries, such as locking the door and cataloging tapes based on bar code. Of course this requires a bar code reader, which we installed at the rear of the unit. It’s a matter of removing a plate on the rear, hooking the power up and screwing the reader into the same holes as the plate used. All in all a good solution for those needing additional storage or only wanting to change tapes once a week.